Order your own copy of Before the Black Throne at your local retailer or online through our website today! Your investigation into the disappearance of four people from a Sliver Twilight Lodge event has opened a new world of terror that stretches beyond the city of Arkham and places the entire universe at risk. 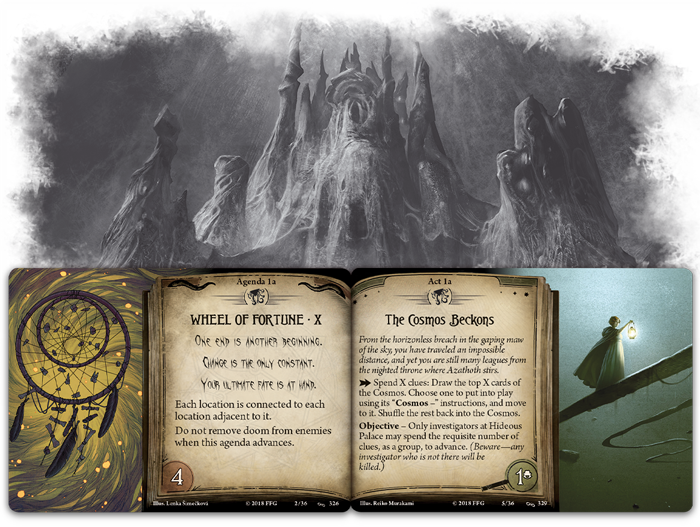 Throughout The Circle Undone cycle, you have chased answers while being hunted by the horrors of Arkham’s evil past. With no clear divide between right and wrong, life and death, sanity and madness, you have been left to question the nature of this world and your place in it. Now, your ultimate fate is at hand and all that remains is to decide whether you will continue the fight or surrender to destiny. 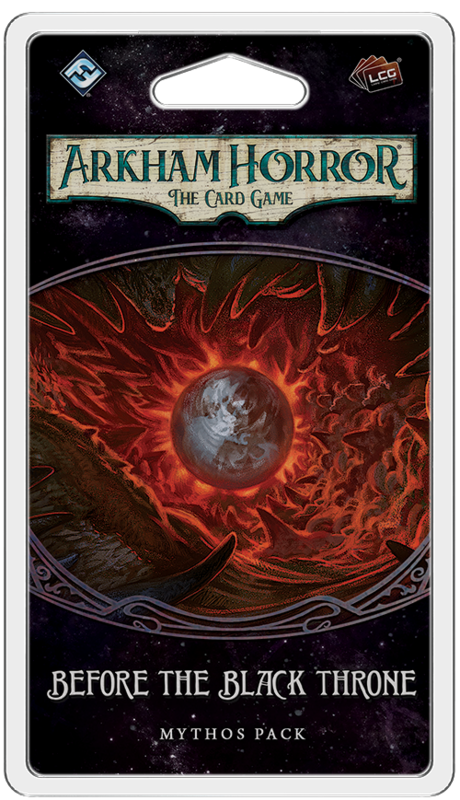 Fantasy Flight Games is proud to announce Before the Black Throne, the sixth and final Mythos Pack in The Circle Undone cycle for Arkham Horror: The Card Game—now available for pre-order at your local retailer or online through our website! One end is another beginning. Change is the only constant. Your ultimate fate is at hand. After your fight to close the rips in reality with In the Clutches of Chaos, you have left your world behind for the joyless void of space. From the horizonless breach in the gaping maw of the sky, you have traveled an impossible distance, and yet, you are still many leagues from the benighted throne where Azathoth stirs. All concept of time begins to fall away as your thoughts are consumed by the sheer force of the nothing that surrounds you. Yet you must continue to press onward. There is no other course. As you journey across the dark and lonely expanse of space, you will discover impossible locations drawn from the new Cosmos deck. In Before the Black Throne, each Act lets you spend clues to draw an equal number of cards from the Cosmos deck and choose one to put into play, moving to this new location and shuffling the rest back into the deck. 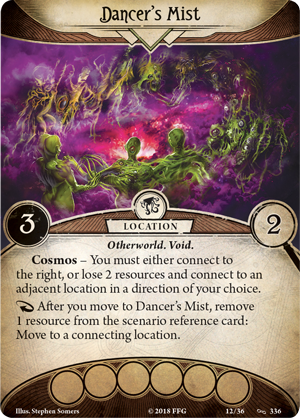 Unlike the other places you have investigated in Arkham Horror: The Card Game, Cosmos locations do not have set connections. Rather, each Cosmos card has a connecting instruction you must obey in order to place it. For example, Dancer's Mist (Before the Black Throne, 336) must connect to the right of your current location. Otherwise, you may spend two resources to buy more freedom in your placement. If you cannot place a location in accordance with its rules, you must shuffle it back into the Cosmos and cancel your movement. 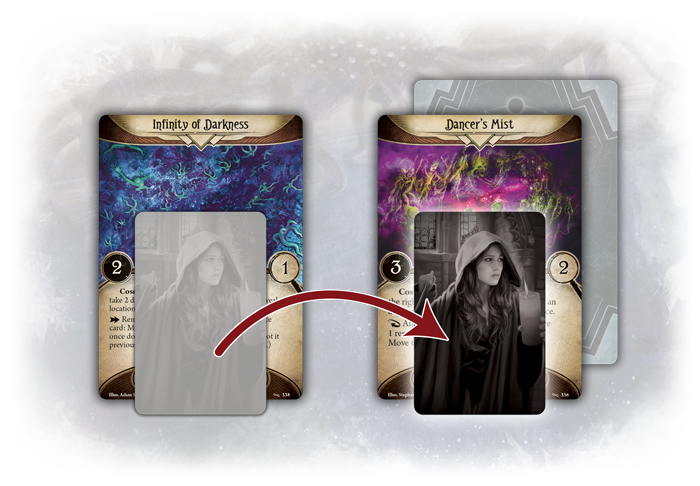 Diana Stanley replaces empty space with Dancer's Mist, moving there and returning the player card to her investigator deck. But while you may see new, incredible vistas in your travels, much of what you will witness is stark, black, nothingness. In this adventure, you may be instructed to bring “empty space” into play. This is not a location—it cannot be entered or investigated—it is merely a section of the seemingly infinite space that divides you from the rest of humanity. In order to add empty space, you must put the top card of your deck facedown in the indicated place. The only way to return the lost card to your deck is if you should fill the empty space with a Cosmos location. After all, even the hideous palace of some Great Old One would be better than this void. 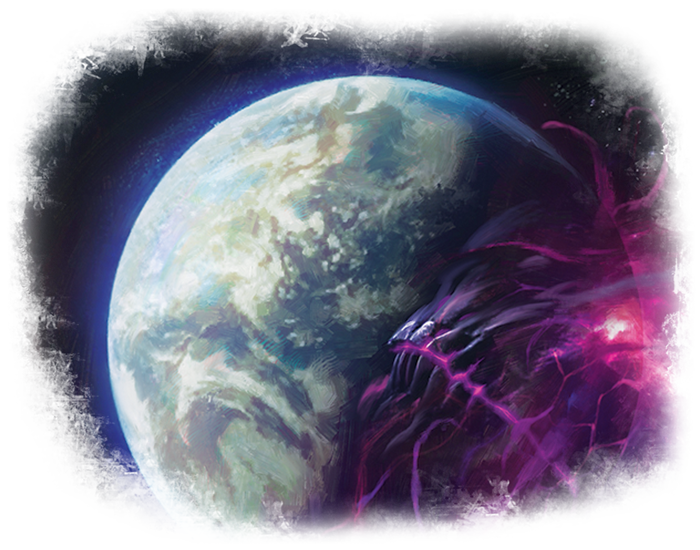 As you venture far into space, breaking away from the rest of humanity, other connections grow inexplicably stronger—some cards in this Mythos Pack feature the new bonded keyword, keeping them specifically linked to other player cards. These bonded cards do not have levels and they are not available as options when deckbuilding. Rather, the cards they are bonded to will summon them into play. For example, you can only execute a Blood-Rite (Before the Black Throne, 317) if you have the Occult Lexicon (Before the Black Throne, 316) that teaches you how to perform it. 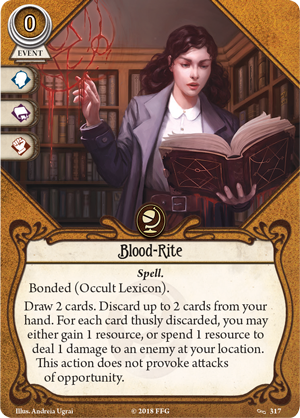 While the lexicon is an asset that you must choose to add to your investigator deck, the event that it summons is not a part of your investigator deck and does not count toward your deck size. In the case of Occult Lexicon, adding this single card to your deck could give you access to three copies of Blood-Rite without removing any other valued cards. Rather, these bonded cards will simply be set aside, ready for the moment you spring them into action! Beyond these new bonded cards, Before the Black Throne also provides a plethora of player cards that are powerful on their own. If you take on the role of a Mystic, you may tap into your Sixth Sense (Before the Black Throne, 322) to investigate with your willpower instead of intellect. To begin, your willpower is increased for the investigation, and with no need to spend charges, you can become as worthy a researcher as any Seeker. But the power of this Spell goes far beyond a simple stat boost. 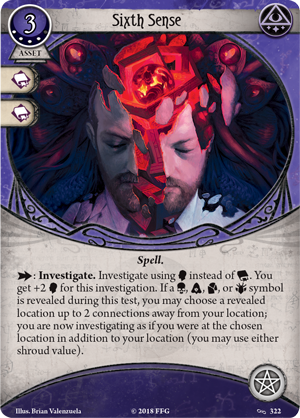 If a skull, cultist, tablet, or elder thing token is revealed, you may choose a revealed location up to two connections away and investigate as if you were in both places at once, choosing whichever shroud value you like. Not only can this mean the difference between a successful investigation and a failure; if you do manage to succeed, you discover a clue from both locations in a single test! With this spell at your disposal, it may make the expanse of space seem just a little smaller, and perhaps make your dire circumstances a little more bearable. Why are you here? Why do you continue to fight? What is the point of anything? After all, you cannot defeat the inevitable. All you can do is delay it for a while. Stare into the void, hold on to hope, and complete the mission you swore to see through! Look for Before the Black Throne (AHC35) when it hits shelves in third quarter of 2019! You can pre-order your copy of this Mythos Pack at your local retailer or online through the Fantasy Flight Games website here!